So I totally apologize for going AWOL these past few weeks. Had to take care of some unexpected family biz, as in my middle school daughter having major anxiety attacks (no worries, got her permission to say this). She’s struggled with anxiety for a long time and usually keeps it under wraps pretty well but it decided to rear its ugly head as of late . . . it’s partly hormonal & partly b/c of the FCAT (our standardized testing in FL). Luckily, she’s getting better with counseling, lotsa prayers, deep breaths, a healthier diet and some remedies we found at our local natural foods market. I asked her if she had any advice for those reading who may be suffering anxiety attacks themselves and she said, “Start a God box!” This was her counselor’s idea. The idea is to take an empty shoebox and decorate it, leaving a tiny slot in the top. Then whatever you are worrying about, write it on a slip of paper and place it inside the box . . . a concrete symbol of giving it over to God. Anyways, to my Kind, Artistic, Yammering, Loveable, Enthusiastic, Earnest daughter ( and yessssss, I did just spell out an acrostic poem of your name with adjectives b/c I’m cOOl like that), I dedicate this song to you . . . I hope you dance. Now the other thing keeping me busy as of late is Cassandra Clare’s Mortal Instrument series. I’ve read the first four, and can’t wait for book 5 due out in May. Clare’s nailed that elusive writer’s voice! 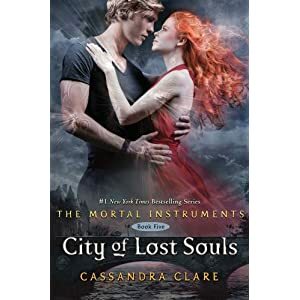 Even though it’s an urban fantasy series, it deals with stuff happening right now in the world of teens: high societies, sexual orientation confusion, fitting in, scandals, fighting (lots of that), death, bff relationships changing, romantic conflicts, lack of attention from parentals, ect . . .
Soooooooooo how about you? Have you read The Mortal Instruments series? If not, what are you waiting for? It’s not too late to read all of them before book 5 comes out (btw, 6 are planned for the series). Rumor on IMDb says they’ve already cast Clary and Jace for the movie!